Charles Bukowski, poet, novelist, short-story writer, journalist, and cult figure of the dissident and rebellious was born in Germany in 1920 and died in the USA in 1994. During his life he was hailed as "laureate of American lowlife" by Time magazine literary critic Adam Kirsch of The New Yorker wrote: "The secret of Bukowski's appeal...(is that) he combines the confessional poet's promise of intimacy with the largerthan-life aplomb of a pulp-fiction hero." Bukowski was one of the most unconventional writers and cultural critics of the 20th century. He lived an unorthodox, idiosyncratic life and wrote in a style that was unique�one that is impossible to classify or categorize. His work was at times cynical or humorous, but was always brilliant and challenging. His life and work are distinguished not only by a remarkable talent for words, but also by his rejection of the dominant social and cultural values of American society. Bukowski began writing at the age of forty and published forty-five books, six of them novels. He is also considered one of the great literary voices of Los Angeles. 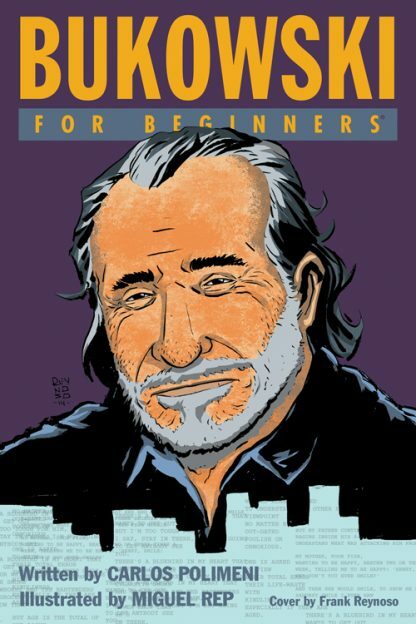 In Bukowski For Beginners, playwright Carlos Polimeni evaluates the life and literary achievements of the cult writer whose voice of dissidence an discontent is still heard and appreciated by readers worldwide. Carlos Polimeni is a journalist, writer, screenwriter, and television and radio host in Argentina. A journalist since 1978, he has worked in television, radio, magazines, news agencies, and newspapers, and has published twelve books on topics of their specialty. He also wrote plays and screenplays. Miguel Repiso, better known as Miguel Rep or Rep-is a cartoonist and graphic humorist in Argentina.